An exclusive interview with Chef Kunal Kapoor, Celebrity Chef and Executive Sous Chef- Leela Kempinski. 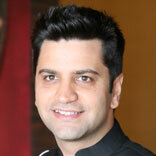 Chef Kunal Kapoor is a known face in the Indian F&B industry. Running a restaurant to hosting the show MasterChef India, he has a vast experience in the food industry. In an exclusive interview with Restaurant India, he tells about the latest F&B trend and the shifts in the eating habits that Indians are going through. Coming from the family’s of bankers, how did you manage to enter in the F&B industry? I have grown up seeing men cooking in my family and seeing my father cook the Sunday meal, really inspired me. He would always make me sit with him and tell me a little about every ingredient. I soon earned the title of 'Chief Stirrer' at home. I heard about the hotel management course from a friend. I was terrible at math and thought why not try this. Soon it turned out that I knew more about food than peers because of the time I spent in the kitchen as a kid. Gradually I got more engrossed in the profession and cooking and trying out new dishes gave me a real kick. It is perfection- art, science, math all rolled into one! How did MasterChef happen? What are the challenges that you went through while handling the show? It just happened that star plus approached me for this show. I was surprised and asked why me? I was told because of the best restaurant awards that I have earned for my restaurants. Hence, they found me a credible judge for the show. On the show one of my biggest challenges was to deal with elimination. There were many people with so many dreams and telling them that they could not make it to the next round was heart breaking. What according to you is the latest trend in the F&B industry? And which cuisine you find is exciting in the world? The latest trend in the food and beverage industry is sourcing local, seasonal and organic produce. There is a huge emphasis that I see where chefs are researching local cuisine and bringing out the local seasonal produce in a new avatar. Recently I launched the new signature kebab at the Leela Gurgaon Indian restaurant, called Haleem kebab. How has the shift changing in the eating habits of consumers in India? There has been a major shift in the eating habits of consumers in Indians are now willing to explore and try out different cuisines which was not seen earlier. It's also seen that people now are turning towards a healthy lifestyle and food habits. They still wouldn't want to compromise on the taste! What according to you is the one thing that can transform a bland meal into a banquet? Any kind of herb when added to a bland meal can transform a bland dish to a banquet dish. For example a regular yellow dal if given a tarka of basil, kadi patta and chili and garnished with lots of chopped coriander would instantly become more appealing. ‘A Chef in Every Home’ is my first book, an honest attempt to explore international cuisine and simplify it so that everyone can experiment with these dishes in their own home kitchens. The recipes are fuss- free and have been created keeping in mind ingredients and equipment that you would find in a normal Indian home kitchen. The techniques have been simplified too, making the book truly A Chef in every home. What advice you would like to give to an aspiring chef in the industry? Experiment with flavours, textures and presentation. Try new ingredients; try old ones with a new technique and create your own unique dish. Nestle Is Upping its Nutrition Segment.. Giving Health A Holistic Approach..
Know the Luxury Market Inside Out.. Global Cuisines That Remain India's Favourite..
Factors That are Driving Real Estate Business..
How to Maintain Supply Chains..
FOCO is a Win-Win Model For QSRs..